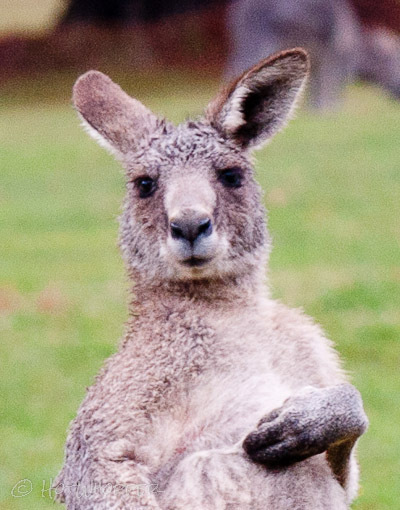 Eric Worrall says there are "Kangaroos Dying of Cold" in Canberra. That's a good one. Eric doesn't know much about Australia and less about kangaroos. I don't know how long he's lived here, but you'd think he'd have picked up some knowledge about the place. Did you know that when kangaroos can't find enough food where they normally go, they'll look elsewhere? It's the same for for a lot of animals - yeah, really. There's a bad drought in parts of Australia at the moment. This is affecting wildlife as well as farmers and their stock. I'll talk about the Australian Capital Territory where Australia's capital city, Canberra, is located because there is a bit of idiocy about it being put about by deniers. Dry weather means frosty nights. It's because less water vapour in the air means more heat escapes at night. During the day the sun comes out and heats things up again. At night it can get extra cold. You're saying to yourself "everyone knows that". Try telling it to climate science deniers. 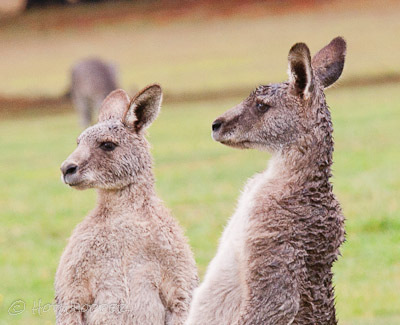 Eric Worrall at WUWT reckons it's frost that brings kangaroos out into open spaces in towns. He's wrong. When it's frosty kangaroos will be warmer in the bush, where the trees and shrubs provide some protection. That's at night, when they are having a sleep. During the day, when it's time for brekky, they'll go wherever they can get some food. If there's a drought they'll hop to the nearest golf course that's got yummy grass. (Edit: the Eastern Grey is diurnal and most active at dusk and dawn. They probably sleep more in the daytime than at night, at least in summer - see comments below here and here). Eric wrote an article about something he picked up from a couple of denier blogs and he decided to share it with climate conspiracy theorists at WUWT. 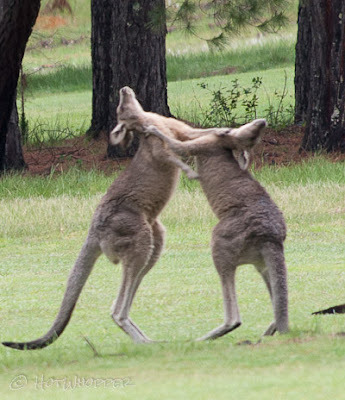 The denier blogs had found something on CNN about kangaroos in Canberra. Instead of pointing out what was slightly misleading in the article, Eric magnified the wrong. If kangaroos are dying in Canberra it's from something other than the cold; however the article he wrote about said nothing about roos dying except as roadkill, certainly not from cold. Eric's scary headline was probably just to get the roo lovers worked up. Or was it to get the WUWT "ice age comethers" all in a tizz? I wonder if Eric knows that kangaroos have fur? Data from the Bureau of Meteorology's weather station at Canberra Airport shows that the ACT endured its driest July since 1982, with just 7.8 millimetres of rain recorded. It was the sixth lowest total on record for July at Canberra Airport, and the worst since the record low of 3.8 millimetres in 1982. The long-term average is 40.9 millimetres, meaning last month's total was just 19 per cent of the usual rainfall levels. The ACT also experienced unusually warm July days, with the average maximum temperature recorded at Canberra Airport - 13.3 degrees - just 0.1 of a degree behind the record set in 2013. The warmest day was July 5, when Tuggeranong reached 18.7 degrees to equal the record for the highest July temperature recorded at that weather station. Canberra Airport recorded 19 days in July with a minimum temperature of minus 2 degrees or lower. It was the first time that had happened since 1971, when there were 20 days in July in which the mercury plunged those depths. In 1953, there were 21 such days. The coldest temperature recorded in the territory last month was minus 7.9 degrees, in Tuggeranong on July 23. Kangaroos don't die from cold when the temperature is 18.7 degrees (66 F), nor do they die from cold when it's frosty, not even at minus 7.9 degrees Celsius. 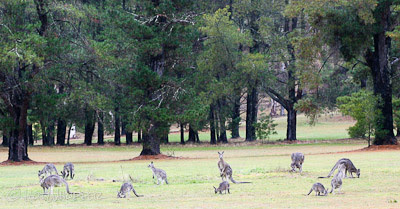 Here are some photos of Eastern Grey kangaroos on a golf course. Not a golf course in Canberra. This one's in the hills below the snowfields in Victoria - my backyard. It can get quite cold here with a few frosty mornings. Not as many frosts as there used to be. Still, I've not seen any kangaroos killed by frosts on our golf course. The main cause of death among kangaroos in winter in Canberra is shooting as part of a culling exercise to reduce the grazing burden in the nature parks. 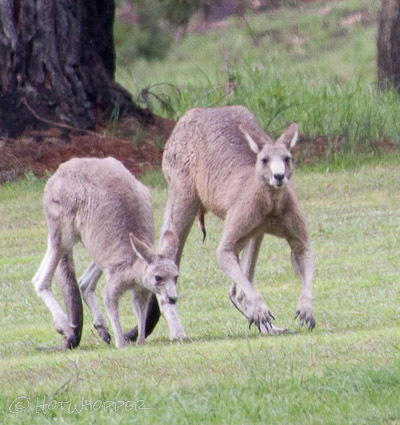 In the absence of predators, and with restrictions placed on farmers' ability to kill native animals, kangaroo numbers have exploded and threatened the biodiversity of the bushland that surrounds Canberra. This has given rise to our very own group of "citizen scientists" who claim that kangaroos do not cause environmental damage and are in danger of extinction. 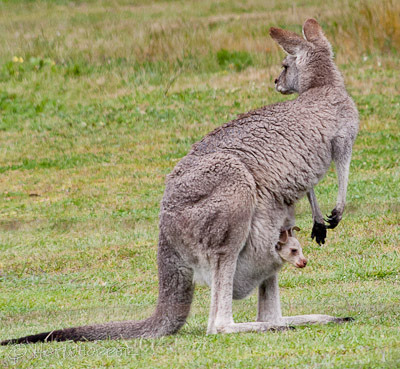 Culling takes place in winter because that is the time when there are fewer dependent young joeys. The second greatest cause of mortality is probably road kill as kangaroos come into the suburbs at nigbt to graze on irrigated sporting fields. The original post is wrong in one respect. 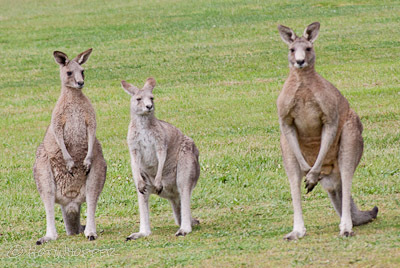 Kangaroos are more active at night than during the day. Hi Wombat - thanks for that extra info. You're right, though. I shouldn't have talked about them sleeping at night as if they go to bed like we do. I'll take your word on the categorisation of Eastern Greys as diurnal. I would only say that years of late night dog walking have taught me two things. One is that I am much more likely to find roos in my suburb at midnight than at midday. The other is that roos which hit cars can move a hundred metres from the road before succumbing to injuries. I would not assume that the one that hit you survived. That's interesting, Wombat. I wonder if it's because it's quieter in the suburbs at night, with not as many cars and dogs around. I always stopped to try to find the roos that ran into the car, but it's not easy in the bush. Wasn't sure what I could do if I found them, being far from civilisation. Never had to find out, or not with a kangaroo. They are hefty animals when fully grown. In fact on a still cold winters night temperature inversion sets in (hence the term "frost hollow") At these times the forested hills around and in Canberra are probably warmer than the suburbs at their feet. Nonetheless the kangaroos travel down to the suburbs at night. They seek food, not warmth. And don't they know there is a 'plague' of Kangaroos in Canberra? All that WUWT fans know about Oz wildlife comes from Kanga in the Winnie the Pooh books. But that won't stop the 'citizen scientists' from advancing theories. One of these days I might get around to reading Winnie the Pooh, or not. As an actual resident of this region (colloquially known as the 'Bush Capital'), I can confirm that the local kangaroos are not dying of the cold around here. What I can confirm is that if you re driving home after 11pm (even if the temperature has drooped below zero already) then the chances are you will need to slow down in certain areas, some of which are very close to my home, to reduce the chance of the many kangaroos grazing at the side of the road colliding with your car. Only this week my wife was assured by another occupant of the car park that she uses that the car he was driving was only a loaner as the nice Mercedes he normally drives was in the shop being repaired after hitting a kangaroo. He said the repairer told him that 60% of his work at the moment was from kangaroo accidents. A work colleague showed me this week the photo of the windscreen from a couple of weeks ago where a kangaroo bounced off it on his way to work. They were very lucky as a) the kangaroo did not end up in the car with them and b) the only damage was to the windscreen. Mind you the kangaroo didn't survive even though the damage to the car was relatively minor. The stories of car/kangaroo connections around here are almost limitless. The only panel damage on my car are a few paw dents in my driver's door from a roo crossing the road without looking both ways 50m from a friend's place as I left reasonably late at night. They have absolutely no road sense unfortunately, but they are certainly not dying of cold!! Off - topic, but Ha! It gets funnier, the descent into Right Wingnuttery continues. Watts has put up a piece of fake news from Andy May with no relation to the stated topic of the site at all. May is lying about the New York Times lying about Trumps' Lies. He's put a lot of effort into an analysis of the NYT's list of Trump lies and - on the numbers - reckons Trump is more honest than the paper. - which the NYT said was based on 'no evidence' has been shown to be the truth because the NYT published an earlier piece about wiretap evidence being gathered during the campaign. Strangely, as the Snopes analysis that May thinks backs him up makes clear, there is no evidence at all that Trump's communications were tapped, or Trump Towers targeted. "In order for the New York Times 4 March 2017 report (“Trump, Offering No Evidence, Says Obama Tapped His Phones”) to contradict the newspaper’s 20 January 2017 report (“Wiretapped Data Used in Inquiry of Trump Aides”), the paper would have had to have provided evidence (or at least asserted) that the earlier article was based on an Obama administration wiretap of Trump’s phones. This, of course, was not the case. " - Donald Trump in a TV debate when Hillary Clinton accused him of claiming that global warming was a hoax created by the Chinese. You'd think a blog ostensibly on climate would mention this mistake/guess/opinion/lie. today. Please don’t postpone the earth. Nothing much surprises me any more. Off-Topic. More mirth, though this is more sad than funny. Anthony has posted a picture tweeted by the Spanish version of himself, Paco Garcia, of a Met Station in Montoro, which Watts states is the source of the all-time high Spanish temperature record set in 2017. And to be fair the equipment is in a sorry state, white paint faded to brown, overgrown vegetation around. Watts uses the photo to accuse the Spanish Meteorological Agency, AEMET, of laziness or incompetence. a close look at the photo of Montoro provided makes it appear to me that no-one has walked inside that enclosure for years. The grass is almost waist high, even immediately inside the gate where the operator would have to walk to get to the screen. So the most likely conclusion is that the AEMET data is from an AWS located elsewhere, the station pictured is decommissioned and AEMET have failed to update the location record. This possibility was apparently not considered by Mr Watts before he published his accusations of incompetence. It will come as no surprise that the above conclusions are based on Nick Stokes doing a little basic due diligence. No doubt the article will be updated or retracted and an apology issued real soon now. And this morning on WattsWatch. To maintain standards, Watts bans a commenter. Gosh, let’s see. Who shall I believe? A. Some anonymous troll named Alley that makes no citations whatsoever and only exists here as a spoil, saying only “Hardly. That’s just wrong.” aka an opinion. B. A man who has followed and studied the issued for decades, and in fact does provide citations. So Alley, if you want to be more believable, who are you and what’s your background? Btw Alley was talking about Ball's risible claim that the IPCC consider CO2 the only influence on climate. Dr Ball retired from academia last century and has never published on modern climate issues. He is a co-author of the 'Slaying the Sky Dragon' book, which has the main thesis that the greenhouse effect does not exist, which puts him in a tiny minority of scientists, putting it kindly. Watts bans 'Slayers' yet gives Ball a regular guest spot on his blog. (Let us face it, nobody else would). More recently, a Judge dismissed a defamation case against Dr Ball, on the grounds that nobody with any sense would believe his BS. (The) “article is poorly written and does not advance credible arguments in favour of Dr. Ball’s theory about the corruption of climate science. Simply put, a reasonably thoughtful and informed person who reads the article is unlikely to place any stock in Dr. Ball’s views.."
So Anthony, on climate, when choosing between Tim and anybody else, you'd be well-advised to go with the someone else. Pretty much anyone else. The WUWT policy includes encouraging "open discussion by people that stand behind their words. ", so naturally Alley had to be banned. Watts discovered that he shared an IP address with another occasional commentator and promptly wielded the banhammer for 'sockpuppetry'. Watts occasionally boasts of the millions of comments made on the blog. He does not mention how many were by 'Smokey' (its a lot, he was a prolific and outspoken contributor a few years back). 'Smokey' was in fact a sockpuppet for Dave Stealey, aka 'dbs' a WUWT moderator. That's right, for years Watts allowed a mod to comment as an 'anonymous coward' in the very threads he was moderating. So, Dr Ball is a respected climate authority, and WUWT is a venue for open and honest debate and Watts is a man of integrity. That's three impossible things before breakfast. All he has to do now is ban the estimable Nick Stokes and the metamorphosis of WUWT into just another right wingnut echo chamber will be complete. I miss Smokey. The times when he'd lose a comment thread, don his "mod" identity, and roll back the thread were a source of constant amusement. Nowadays WUWT manages its hypocrisy with greater competence. I know it's OT - but out of interest here is the thread Watts put up explaining why Stealey was ousted. Smokey is occasionally active in the threads at the blog run by Scott Adams, the cartoonist who draws 'Dilbert', a strange venue you might think but Adams is a climate change denier and Trump apologist. Not a good look. I outed Smokey as Stealey and he denied even that, then went on to make the exact same arguments as WUWT-Smokey with the exact same collection of shonky graphs. I can't find that thread now using either the search or Google. Slightly odd, but probably just a glitch. Ah, found it. I won't post a link to a denier site, but here's the exchange. Tell me, are you the same Smokey (David Boehm Stealey) who used to simultaneously and secretly moderate and sockpuppet-post at WUWT? The site that has this policy ." If you think your opinion or idea is important, elevate your status by being open and honest. People that use their real name get more respect than phantoms with handles. I encourage open discussion by people that stand behind their words." In which case, my apologies. My bad. See, there was this poster at WUWT, outspoken defender of the party line, using the exact same shonky arguments and even shonkier charts, and also named Smokey. Little did unsuspecting posters realise that Smokey was the sockpuppet of David Boehm Stealey, site moderator, using his mod powers to censor and delay anyone who demurred. Until one day Smokey carelessly posted using his gravatar and the sordid game was up. So when I saw a disqus user named Smokey, arguning against AGW and tagged @dboehm I kinda joined the dots. My bad. I guess Boehm must be a really common name. Sorry. Why, sometimes I've believed as many as six impossible things before breakfast. The Queen, in Alice in Wonderland. Remember when Anthony Watts told us that the alarmist myths around coral bleaching on the Great Barrier Reef were busted, because of a paper showing that coral bleaching happened before? Here we show that corals bleached pre-industrially, but subsequently, bleaching has intensified. Some (not me, you understand) might be tempted to conclude that Mr Watts is incapable of lying straight in bed. Also the paper reinforces the correlation between sea temperatures and bleaching, and as a final giggle, the reconstructed temperatures used are from (drum roll) Mann et al 2008. Let's not forget the day a senator brought a snowball into the senate to prove that senility can affect people from every station in society. It's amusing to see the spat between Monckton and Eschenbach on the conspiracy blog. Monckton being there repeating his bizzarre "temperature has a feedback, op-amp "theory"" for he hugs and kisses he failed to gain from real peer-reviewers. Monckton does seem to be losing it at the moment. I've even found myself in the unsettling position of being defended from his attacks by a mod. the stated objective of the left is to destroy everything American. I'm late to the party so I can only repeat that greys are crepuscular but will happily move about during both daylight and night hours, if they feel safe, and that they're not phased by Canberra winters. Kangaroos and other macropods are basically the Australian equivalent of deer in the way that they fill a type of niche, but Australia's relative aridity/infertility compared to other continents results in the otherwise remarkable convergent evolution selecting hopping as a form of locomotion rather than walking/running. A lot of energy is stored in the tendons, which are effectively biological springs. This permits them to move far and fast with a very efficient use of energy - a distinct advantage in an environment where energy is hard to come by. Put longer legs on the front of a macropod though, and you basically have a deer... Oh, and there's the monotreme/eutherian thing as well, but this only goes to reinforce the convergence in what are otherwise extremely separated taxa. BBC Radio 4 had a piece today on the drought affecting large parts of Australia. They even went so far as to risk offending the right wing of the Tory party by mentioning it might possibly be due to climate change. No doubt they will later have to repair the damage done by inviting renowned climate scientist Nigel Lawson on to set everybody's mind at rest. Organisers in France claimed 115,000 attended in that country alone. 350.org, who organised the event said there were over 900 events in 95 countries. The UK Independent reported 'over 1,000' events. SF is obviously going to be an outier. So let us be conservative and say the average attendance was just 250. Over 900 events that would be 225,000 protestors. That's 'hundreds of thousands'. Add innumeracy to Watts' attributes. Watts has embraced Trump as "his" President. In Watts world the Trump inauguration rally was the largest in American history. Actual numbers are not important. Come back Sou, we miss you. I know, Phil. I'm feeling dreadfully guilty. I make promises and don't keep them.